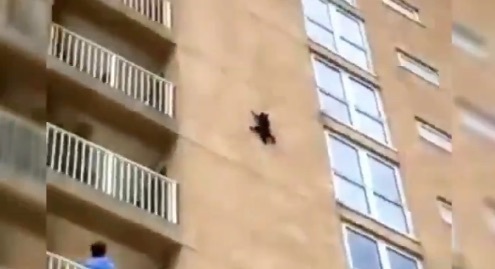 This a domestic cat who decided for some unknown and bizarre reason to climb a block of flats from the outside. He thinks he is Tom Cruise in Mission Impossible or Spider Man. The wall looks suitable for gripping but the challenge is way to hard. Fortunately the cat fell onto a sandy beach and was probably fine. It’s just extraordinary that a cat would try to do this. It’s called cat parkour but this is unpleasant. It is unsettling to see it. This entry was posted in climbing and tagged cat climbing, cat parkour, cat video by Michael Broad. Bookmark the permalink. I have seen cats be hit by vehicles hard, then immediately run away, seemingly uninjured. I have known that two of them were very seriously injured, one did not make it. I couldn’t watch the clip. I can rarely watch such events anymore. I hope the cat was not injured. A crowd did gather, one person catching the fall on their phone apparently. It fell 7 & 1/2 stories (75 feet) ending with a belly flop onto the sand, luckily. The cat immediately got up and ran off. Yeah, how freaking unusual for the cat to climb the wall like that. He wanted to do it for SOME reason, either out of fear or because he was drawn to something. There was no dog or kids at street level who might have chased him. No birds’ nests on the building. That was really, really weird, but glad the cat wasn’t hurt but who knows. I just had a thought: that the cat escaped an apartment but because cats are built to climb up, not down, he ended up where he was. The cat hit the ground at approximately 33 mph. …I was curious.